Today we will discuss some practice questions (MCQ) on heat transfer and thermal expansion. You may click here to obtain the essential points you need to note in this section. This question is meant just for checking your knowledge of the behaviour of water. Water has maximum density at nearly 4º C and hence the correct option is (d). In order to melt 5 g of ice (into water) without change of temperature 400 calories of heat are required since the latent heat of fusion for ice-water change is nearly 80 calories per gram. The heat that is released by 10 g of warm water at 10º C on cooling to 0º C is 100 calories only since the specific heat of water is 1 calorie per gram per Kelvin. So the warm water can melt just a quarter of the amount of ice and the mixture will remain at 0º C [Option (a)]. The molar specific heat of a mono atomic ideal gas at constant pressure (cp) is 5R/2 where R is the universal gas constant. [The molar specific heat of a mono atomic ideal gas at constant volume (cp) is 3R/2 and in accordance with Meyer’s relation, cp = cv + R]. Therefore, the amount of heat required to raise the temperature of one mole of an ideal mono atomic gas through 2º C at constant pressure is 1×(5R/2) ×2 = 5R. On heating, the copper strip will suffer greater elongation and hence the bimetal strip will bend with the steel strip on the concave side. [Bimetal strips are widely used in thermal switching applications such as automatic electric iron]. 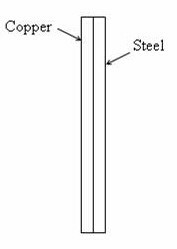 The quantity of heat conducted is directly proportional to the area of cross section and inversely proportional to the length of the rod (when the same temperature difference exists between the ends). [Remember that the quantity of heat Q = KAdθ/dx where K is the thermal conductivity, A is the area of cross section and dθ/dx is the temperature gradient]. When you compare rod (a) with rod (b) you find that rod (a) can conduct better since its length is less than that of rod (b). Rod (a) and rod (c) conduct equally since the cross section area as well as the length of rod (c) is 4 times that of rod (a). Rod (d) is better than rod (a) since its cross section area is 9 times that of rod (a) while its length is only 8 times that of rod (a). Rod (e) is worse than rod (a) since its cross section area is a quarter of that of rod (a) while its length is half that of rod (a). Therefore, the rod which will conduct the maximum quantity of heat is (d). [It is enough to compare the ratio of the area to length. The area is directly proportional to the square of the radius. Since the unit of radius is centimetre and that of length is metre in all cases, you can blindly compare the values of 12/1, 12/2, 22/4, 32/8 and (0.5)2/(0.5). The highest value is 32/8].